The goal of Buddhism is to recognise one’s own free and fearless nature. Buddhist practitioners use Buddha statues in order to identify with this perfect and natural state, called enlightenment. 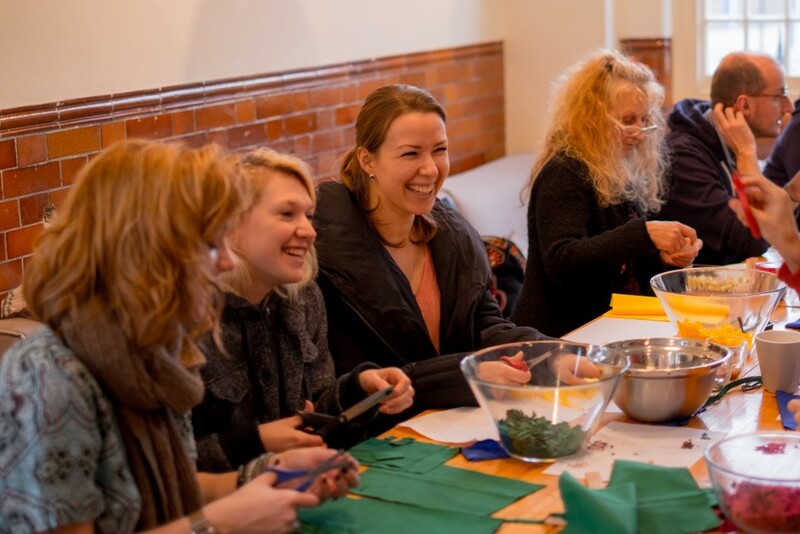 The Beaufoy London Diamond Way Buddhist Centre in Lambeth recently hosted a statue-filling weekend course, in which a total of 50 statues were prepared for use as instruments for meditation practice. What made this weekend so special was the fact that approximately 100 people came together from across the UK in order to learn the tradition and carry this activity on into the future. There are many different kinds of Buddha statues, emphasising different aspects of mind’s limitless perfection. Buddha statues have been made for over two thousand years and for the past few hundred years they’ve been made primarily in Kathmandu, Nepal. They can be made out of a number of different metals, but bronze and copper are most commonly used. The statue maker begins the process by sculpting the figure out of wax, in order to make the clay mold into which the metal is poured. For a high quality statue, this process alone can take weeks and if there is even a slight flaw, the process must be repeated from the very beginning. The final part, the filling process, is not so much about the practicalities of it, but the approach taken by the practitioner: the participation, wishes, generosity, diligence and care. A properly finished statue constantly radiates benefit to the surrounding area. The statues are filled with the following precious items: rolls of mantras (sacred syllables), a ‘life tree’ (representing the Buddha’s body, speech and mind) and various other substances, such as flowers and incense. In preparation of the statue-filling weekend, there had therefore been weeks of ‘mantra rolling’. For this, saffron water was boiled and applied to sheets of mantras. The individual mantras were then cut and rolled. We would like to say a special thank you to all the friends who rolled a total of approximately 400 mantra rolls in the weeks prior to the event. At this point it’s also worthwhile mentioning that in March 2015 the London Beaufoy Institute hosted the inauguration of a truly majestic and unique Buddha statue. It is majestic in terms of its unparalleled beauty and unique in terms of the way in which it was made, using the most advanced Western laser and sculpting technology. The statue truly demonstrates its luminosity and celestial magnificence when the great hall of the Beaufoy is filled with natural sunlight. As always, friends from all over the world invested much of their time and effort to make such a large-scale statue filling project a success. Five such statues were made for Diamond Way Buddhist centres across Europe. The first to be inaugurated was at the Europe Centre, about which Lama Ole Nydahl said “before we lifted the curtain off, you really had the feeling ‘this statue is breathing’”. The London Diamond Way Buddhist Centre now has quite a track record in sharing the vast and profound cultural insights and craftsmanship of Tibetan Buddhism with the local community. In May 2012, we hosted an exhibition of Tibetan Buddhist Art entitled ‘Space for Mind, Space for Art: treasures of Tibetan Buddhism, and contemporary responses’. We look forward to the next statue-filling course!